Our Cottage Bunkies feature a steeper roof pitch to give extra space for the loft and come with a fold-away ladder (not shown in design center). 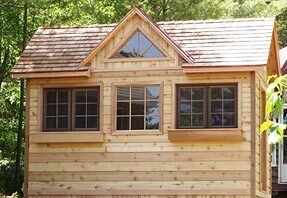 This gorgeous 8 x 14 Cottage Bunkie features two bar windows, a picture window and triangular window in the dormer. The premium door is still awaiting the completion of the deck and stairs.